According to the U.S. Census Bureau, as of 2010, New York was the third largest state in population after California and Texas, with a population of 19,378,102, an increase of over 400,000 people, or 2.1%, since the year 2000. The population change between 2000-2006 includes a natural increase of 601,779 people (1,576,125 births minus 974,346 deaths) and a decrease due to net migration of 422,481 people out of the state. Immigration from outside the United States resulted in a net increase of 820,388 people, and migration within the country produced a net loss of about 800,213. This means a very small population change for the state. The distribution of change in population growth is uneven in New York State; the New York City metropolitan area is growing considerably, along with Saratoga County, while most of Western New York is nearly stagnant. According to immigration statistics, the state is a leading recipient of migrants from around the globe. Between 2005 and 2005, immigration failed to surpass emigration, a trend that was reversed since 2006. New York State lost two house seats in the 2011 congressional reapportionment, secondary to relatively slow growth when compared to the rest of the United States. The center of population of New York is located in Orange County, in the town of Deerpark. Roughly 64% of the state's population lives in the New York City metropolitan area and 53% in New York City alone. The Manhattan Chinatown (紐約華埠). Chinese people constitute the fastest-growing demographic nationality in New York State. 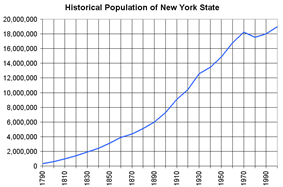 New York State has a primarily urban population. The largest city in the state is New York City, which is also one of the world's most ethnically diverse and cosmopolitan cities. Additional major urban centers include Albany, Buffalo, Rochester and Syracuse. The state has 62 counties; the most populated one is Kings County (Brooklyn). As of the 2010 census, New York State has a population of 19,378,102, including 12,740,974 (65.7%) white, 3,073,800 (15.9%) black, 1,420,244 (7.3%) Asian, 8,766 (0.0%) Pacific Islander, and 1,441,563 (7.4%) of other races. 585,849 (3.0%) has two or more races. Hispanics and Latinos of all races make up 3,416,922 (17.6%) of the state's population; non-Hispanic whites make up 58.3% of the state's population. According to 2004 estimates, 20.4% of the population was foreign-born. Among cities in New York State, 36% of New York City's population is foreign-born; this figure of approximately 3 million is a higher total number of foreign-born residents than any other U.S. city. The top ancestry groups in New York State are Italian American (15.8%), African American (14.4%), Hispanic (14.2%), Irish (12.9%), German (11.1%), English (6%), and Polish (5.27%). 1.5% of the state population is multiracial. New York contains the largest Puerto Rican population in the country, concentrated in parts of New York City such as the Bronx, Brooklyn, and Manhattan. New York also has the largest Dominican population in the country, concentrated in New York City's Upper Manhattan and the Bronx. New York City is home to many blacks, the majority with roots in the United States but a group which includes those with roots in Caribbean Islands like Jamaica and Haiti, as well as recent immigrants from Sub-Saharan African countries. The Bronx has a large population of blacks of Latin American origin, but so does northern Manhattan (Harlem) and Brooklyn which had American-born black majorities since the 1920s, as well the largest African American population of any state. New York City has 1 million of New York State's 1.4 million Asian Americans. At 520,000 of New York State's over 600,000 Chinese Americans, New York City has a higher total number of Chinese Americans than Los Angeles County. New York also has the highest and growing proportion of Pakistani Americans and Bangladeshi Americans in the country, and a very high Indian American community, mainly concentrated in New York City. Unlike New York City, smaller cities in Upstate New York, especially Western New York, are not as diverse. Cities such as Buffalo and Rochester are predominantly made of African Americans, Puerto Ricans, and ethnic European whites. Among New York State's cities, as of 2010, New York City is 44% white, 28% Latino, 25% African American, and 13% percent Asian American. The city of Buffalo, New York state's second-largest city, is 50% white (45% non-Hispanic white), 38% African American, 10% Latino, and 3% Asian American. The state capital of Albany is 57% white (54% non-Hispanic white), 30% African American, 8% Latino, and 5% Asian American. The intense development, urbanization and suburban sprawl of New York City makes it the most populated region in the U.S., an estimated 20 to 30 million in the eight-state Megalopolis stretching 500 miles from Boston to Washington DC, with New York City in the middle has 15 million residents in a 100-mile radius including Philadelphia (1.5 million in its city limits), northern New Jersey and Connecticut. The bulk of New York's population lives within two hours of New York City. 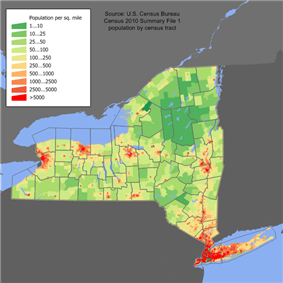 According to the July 1, 2004 Census Bureau Estimate, New York City and its six closest New York State satellite counties (Suffolk, Nassau, Westchester, Rockland, Putnam and Orange) have a combined population of 12,626,200 people, or 65.67% of the state's population. According to the 2000 U.S. Census, 13.61% of the population aged 5 and older speak Spanish at home, while 2.04% speak Chinese (including Cantonese and Mandarin), 1.65% Italian, and 1.23% Russian . In age demographics: 6.5% of New York's population were under 5 years of age, 24.7% under 18, and 12.9% were 65 or older. Females made up 51.8% of the population. New York state has a fluctuating population growth rate, it has experienced some shrinkage in the 1970s and 1980s, but milder growth in the 1990s and the first decade of the 21st century. The most common American English accents spoken, besides General American English, were the New York City area dialect (including New York Latino English and North Jersey English,) Hudson Valley English (including the Western New England accent around Albany,) and Inland Northern American English from the Buffalo and upstate New York area. As of 2010, 70.72% (12,788,233) of New York residents age 5 and older spoke English at home as a primary language, while 14.44% (2,611,903) spoke Spanish, 2.61% (472,955) Chinese (which includes Cantonese and Mandarin), 1.20% (216,468) Russian, 1.18% (213,785) Italian, 0.79% (142,169) French Creole, 0.75% (135,789) French, 0.67% (121,917) Yiddish, 0.63% (114,574) Korean, and Polish was spoken as a main language by 0.53% (95,413) of the population over the age of five. In total, 29.28% (5,295,016) of New York's population age 5 and older spoke a mother language other than English. 1% of the people surveyed refused to answer.